by Haley Goetz Brazil is widely and rightly considered to be a faithful homage to George Orwell’s seminal novel, 1984. The film, like the novel, tells the story of a lowly clerk in a large firm that is dedicated to the deletion of certain disruptive people in society. 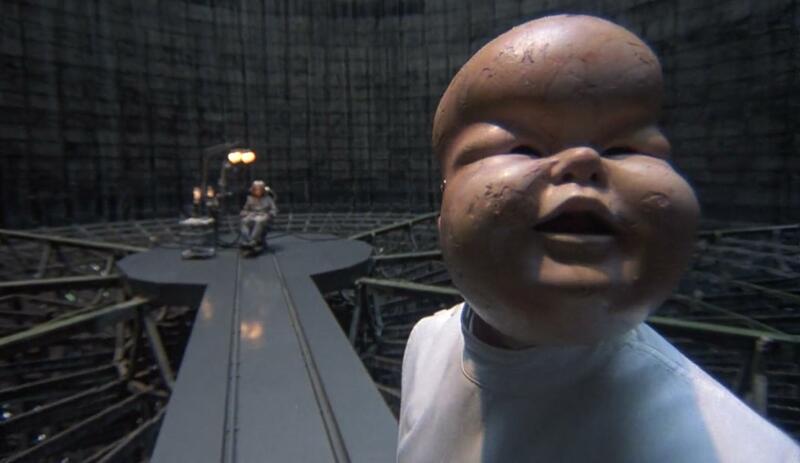 It speaks of oppression in an off-handed manner, employing Terry Gilliam’s trademark black humor. The film’s whimsical score only further contributes to the film’s satirical success and enduring status. Brazil tells the story of Sam Lowry (Jonathan Pryce), a mediocre clerk in a near-futuristic yet drab society. Lowry works for the government, sorting papers and doing other administrative duties that would make anyone bored out of their mind. His job is to report people who should be jailed or eliminated (which is a stark similarity to the job of Winston Smith in 1984). When absentmindedly swatting away a fly one day, Lowry makes the mistake of slamming the dead fly onto a piece of paper that has the name “Tuttle” on it. This changes the Tuttle to “Buttle,” which causes an innocent man to be taken away from his family. Sam finds out who the real Tuttle is and joins a resistance against the government (another similarity to Winston). All is not as it seems, however, for that is the true hallmark of an Orwellian homage. Gilliam is an auteur in the truest sense. Similar to filmmakers like Quentin Tarantino and Martin Scorsese, Gilliam has a style and sensibility that is wholly his own. The director of such beloved cult classics like Fear and Loathing in Las Vegas and Monty Python and the Holy Grail, Gilliam has a distinct fanbase. I consider myself a rather big fan of Gilliam’s particular style, and I gained a huge appreciation for him through Brazil. It is not only an influential piece of science-fiction cinema, but it is also a scathing critique of modern society and its follies. Brazil shouldn’t be a warning, though. Rather, it should be a look into how change can come about through the actions of but a few people. Even if their efforts prove fruitless (as is the case in 1984 and Brazil), all that matters is that these people tried. Jonathan Pryce effectively plays Sam Lowry. He’s expressive, but not too expressive. He’s sensitive, but not too sensitive. He’s a man with strong convictions but not a lot of ambition to actually get much done. He’s basically your average human being. Anchoring Lowry are two other characters of equal importance to the story. The first is Harry Tuttle (Robert De Niro in his cinematic prime). Tuttle comes to Lowry by accident, and they become buddies. The second character is Jill Layton (Kim Greist), who later becomes Lowry’s love interest. She leads the revolt against the government, and it is through her that Lowry’s eyes are opened to the truth. Another interesting aspect of Brazil is the multitude of dreamscapes that are featured throughout. Lowry continually dreams of flying away and meeting a beautiful woman. These dreams are shrouded in a misty, ethereal light, which adds to the outlandish tone of the film as a whole. But when he’s taken out of these reveries, he finds that he’s still stuck in the same dull lifestyle as before. The thing that makes Brazil work is its utter outlandishness. The set pieces create an atmosphere that is both ridiculous and creepy. There’s a scene that feels straight out of a Doctor Who episode in which Sam is out eating dinner with his shrill mother, Mrs. Ida Lowry (Katherine Helmond) and her group of friends. Their food is of a strange, microwaveable consistency and all they talk about is Lowry’s banal and boring job. It becomes easy to see that Lowry is quite bored with his life and ready for a change to occur. When the restaurant is suddenly bombed, Lowry is the only one who reacts. His mother and the other ladies continue eating and socializing as if nothing is going on. Brazil is a film that allows its audience to think. By having lighthearted elements interspersed with a darker overall plot, the audience is situated in a strikingly innovative way. Brazil is an interesting film, to say the least. It is a direct critique of society and people’s indifferences to certain actions and injustices. Sam Lowry’s story is that of an ordinary man thrust into extraordinary circumstances within a wildly authoritarian regime. Looking at this film more than three decades after it was made, it’s useful to look at it as a piece of social commentary. Brazil is a warning to us all. What must we do when society goes so awry? We must stand up, as Sam Lowry does, even if our actions don’t necessarily produce a completely positive end result.